Ralph Seliger writes mostly about Israel and Jewish cultural and political issues for a variety of venues. 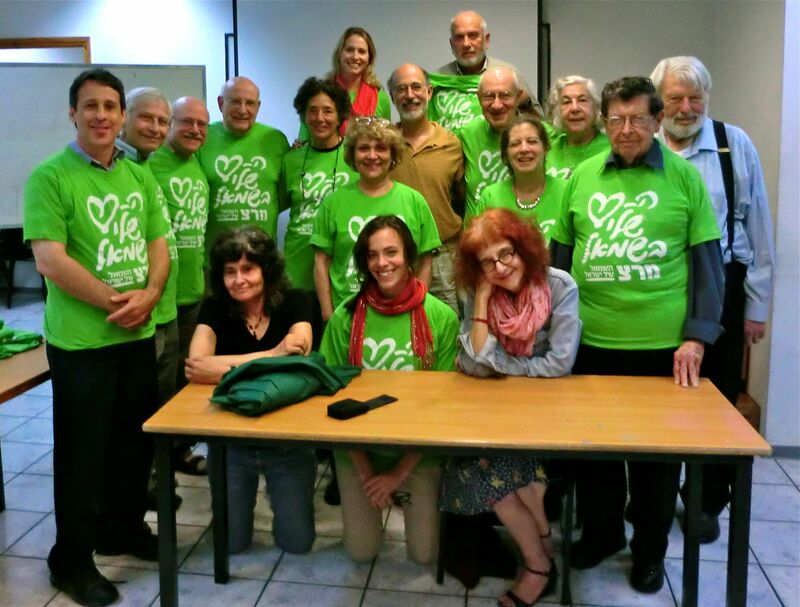 Group photo with "My heart is on the left" Meretz T-shirts; Shani Chabansky is front & center; Theo Bikel stands at the back, right. Here we are on the week-long “Israel Symposium” of Partners for Progressive Israel in late October, with Shani Chabansky — then still a Tikkun intern — who blogged on our trip here. Symposium participants were an impressive bunch, including: five university academics (two historians, one philosopher, a journalist, and an astronomer), an internationally celebrated singer & actor (our board chair, Theodore Bikel), a retired school principal, and a very impressive graduate student in international relations. We were primarily guests of the Meretz party in Israel, but for one day, we were hosted by the Palestinian Authority and the PLO in Ramallah. It was there that the veteran PLO official and Geneva Accord peace activist Yasser Abed Rabbo confirmed Bernard Avishai’s account of how close the Abbas-Olmert negotiations came to peace in 2008-’09 (see Avishai’s article in the December 2011 issue of Harper’s, and his earlier piece in the New York Times Magazine, February 11th, 2011). Along with the legal difficulties that forced Ehud Olmert’s resignation, the war in Gaza cut short a promising effort, as Olmert’s government chose not to attend what was meant to be a concluding round of talks scheduled by George W. Bush and Secretary of State Rice during the closing weeks of his presidency. Rabbo indicated that the P.A. planned to send negotiators to Washington, D.C. for a meeting set to begin Jan. 6, 2009, even in the midst of what we now need to regard as the first Gaza war. Forgive me if I seem egocentric here. My sister has lived in Connecticut most of her adult life, where her husband is a recently retired math professor at the University of Connecticut. Her home is in Storrs, where UConn has its main campus, in the northeastern corner of the state, at least a two-hour drive from the scene of the school massacre in Newtown, CT. She’s informed me that she met one of the victims once, because she was a family friend of a UConn colleague. This victim was the school psychologist, Mary Sherlach, 56 years of age. I also recall that I had a similarly remote connection to one of the victims of the attack on Mumbai, India in 2008, again through my sister. Her oldest son had a colleague, an Indian-American, who was murdered by the Islamist terrorists because he was discovered to be a U.S. citizen. What’s that notion of all of us being connected within just a few degrees of separation? Regardless, anyone with a modicum of human feeling will be moved by such terrible events. I know, as discussed on this blog, that we need to wrestle with more profound cultural changes than passing some laws or regulations. But I dearly hope that this time, this horror provides enough momentum to outlaw assault weapons and high-capacity ammunition clips. We may not yet be able to win the battle to outlaw all handguns — pistols actually take many more lives than rapid-fire assault weapons — but we can make progress on that front as well. Partners for Progressive Israel strongly endorses the application of Palestine to be accorded Non-Member Observer State status at the United Nations and calls on Israeli Prime Minister Binyamin Netanyahu to do so as well. As a longstanding member of the American Zionist movement and as an organization that traces its roots to the days of Israel’s creation, we regard the Palestinian application as a vital step forward towards a durable, just, comprehensive, negotiated two-state peace, which is the only way to secure Israel’s existence as a democratic, Jewish-majority state. The recent violence between Israel and Hamas-led Gaza has underscored that any attempt to ignore the Israeli-Palestinian dispute and any effort to indefinitely maintain the status quo of ‘manageable Occupation’ and ‘low-intensity conflict’ – as Israel’s current government seems inclined – is dangerous folly that is certain to exact a growing price in suffering and death on both sides. Two Palestinian groups are vying for dominance of the Palestinian national movement: The Islamist Hamas, which controls Gaza, condones the targeting of civilians, and does not accept Israel’s fundamental legitimacy. And the Fatah-led PLO, the internationally recognized representative of the Palestinian people, whose leader, Mahmoud Abbas, has endorsed the two-state solution, rejected violence and terrorism, rejected efforts to delegitimize Israel, and is preparing his people for the difficult, but necessary, concessions that a peace agreement will entail. At this crucial juncture, it is the obligation of the international community, including Israel’s greatest ally, the United States of America, to make sure that the strategy of coexistence and moderation is rewarded, and that the Palestinian people are offered a horizon in which they are able to realize a viable, contiguous, independent state alongside Israel not through guns and bombs, but via the tools of statecraft and diplomacy. “The Flat” (Hadira) is so compelling that I couldn’t refuse when invited to meet this award-winning documentary film’s creator, Arnon Goldfinger, even as I prepare for my departure for Israel at the end of this week. It is clever and engaging, with light moments that flow naturally into what turns out to be a heavy and mysterious theme. The story begins almost exactly like another recent but very different Israeli Holocaust-related documentary, “Six Million and One,” with unexpected discoveries as family members clean out the Tel Aviv apartments of a recently deceased parent (in “Six Million…”) and of a 98 year-old grandmother (in “The Flat”). Filmmaker Arnon Goldfinger discovers clippings of a series of articles published in a Nazi newspaper in 1934 Germany, which provides a glowing account of a high-ranking Nazi official visiting Palestine, accompanied by none other than his own grandparents, Kurt and Gerda Tuchler. His grandfather was a Zionist representative who guided Leopold Itz von Mildenstein, an S.S. and S.D. (Nazi intelligence agency) bureaucrat on what resembled a typical tourist excursion to Palestine, along with their respective wives, seeming from the photographs to be thoroughly enjoying each other’s company. Mildenstein headed the Nazis’ “Jewish Affairs Department” and recruited Eichmann, who eventually succeeded him as its head. During his 1961 trial in Israel, Eichmann confirmed this on camera, and the fact that Mildenstein formulated the pre-war Nazi strategy to pressure its Jewish population to leave. In Goldfinger’s follow-up investigation, he locates Mildenstein’s daughter, Eda, in Germany, and discovers that the Tuchlers maintained a friendship with her family through the 1930s and (astonishingly) after the war. The Midlensteins amiably saw the Jewish couple off at dockside when they emigrated to Palestine in 1936. Even the dark fact, which the filmmaker discovers on camera, that his great-grandmother (his grandmother’s mother) was deported and perished in a concentration camp during the Holocaust, does not prevent their renewed friendship. Gerda Tuchler’s mother, Suzanna, had refused to leave her German home until it was too late. As Goldfinger explained to me, she changed her mind after the great pogrom known as Kristalnacht, Nov. 9, 1938, but was stymied by the British who refused to give her an entry certificate to Palestine—apparently due to the severe limitations placed on Jewish immigration in conformity with their 1939 White Paper. I’ve discussed this with others who have commented on Eli Zaretsky’s recent post, “Why Obama Lost the Debate.” Now that the Biden-Ryan debate is history, it becomes more clear than ever to me that even when the Democrat shows up swinging, as Biden did and Obama didn’t, they miss a key point: they have let the Republicans change the conversation from the malfeasance and abuses of Wall Street to the Federal deficit and the imagined misdeeds of unionized public employees. Like Bertram Miller, one of those I engaged with at Eli’s post, I’m a tremendous fan of the Nobel Prize-winning economist and NY Times columnist Paul Krugman. From day one of the Obama term, Krugman pointed out that the size of the stimulus package that was passed within the opening weeks of the Obama administration would be too small to turn the economy around completely and thereby create an opening that would be deftly exploited by the Republicans claiming that government spending not only doesn’t work but also is a problem in itself. Some voices within the administration–including, surprisingly, the oft-reviled Clinton-era hand, Larry Summers–agreed that the package was too small, but support in the Senate seems honestly to have been inadequate for something bigger. Unlike Bertram Miller, I don’t think that the 60-vote filibuster hurdle could have been transcended through a budget-reconciliation maneuver, which is designed for a more narrow and specific purpose than this huge piece of legislation. But the administration has fallen down in not explaining and then vigorously defending what it was doing. The Democrats have needed all along to defend the principle of smart, socially and economically useful governmental expenditures, especially at this time of severe economic downturn. They kind of do that, but not very clearly and without the relentlessly effective simplicity of the GOP’s small government/free enterprise sloganeering. If one can forgive the militaristic tone of “Osama bin Laden is dead and General Motors is alive,” which Biden coined at about the time of the Democratic National Convention, this is a good counter slogan. But how ever this message is worded, it needs to show the administration’s concrete achievements (literally) in infrastructure and other spending to staunch the headlong slide into another Great Depression. For example, how is it that the Dems haven’t energetically pointed out that in not renewing the subsidies to the states in the original stimulus legislation, the Republicans have forced the layoff of a half million state and local civil servants, including many teachers, firefighters and police? It’s Sukkot, the seven or eight-day autumn holiday (depending upon how you classify Simchat Torah) in which religious people eat their meals in a loosely constructed booth (a sukkah) gaily decorated with plant materials. 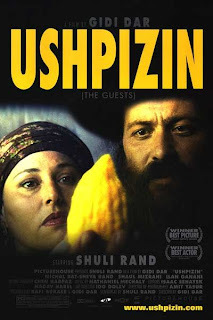 “Ushpizin” is a charming seriocomic Israeli drama, made in 2004, depicting a particularly tempestuous Sukkot in the lives of a Hasidic couple in modern-day Jerusalem. Liberal Jews have strong feelings about the limited cultural vistas and the unhealthy political influences that we see on Israeli policies from this quarter–more perhaps in the intrusion of religion into the affairs of state and civil life than on attitudes toward peace-making, where the Haredim (ultra-Orthodox) are often confused with the national-religious camp. But this film reminds us of the positive spiritual dimension to the Haredi lifestyle. Dramatic changes of fortune are seen as divine intervention, an answer to their devotion and a part of their ongoing dialogue with God. When bad fortune strikes, they are rendered bereft not only by the event itself, but also by the notion that they have done something displeasing in the eyes of God or, even more painfully, that their suffering has meaning they cannot fathom in the sacred scheme of things. When I think of my parents’ tale of survival, and what they lost, the Holocaust becomes personal. It also has occurred to me that my father was never more savvy nor persevering in his life than when leading his young wife and her widowed aunt to safety in the United States: through countries under attack (Yugoslavia and Greece) and in rebellion (Iraq) to the other side of the world (British India), and back around the horn of Africa, up to the Americas and to New Jersey where they first settled. Sept. 28 marks the commercial debut of “Six Million And One,” David Fisher’s true-life depiction of his Israeli family coming to grips with how the Holocaust affected them. Twelve years after his survivor-father’s death, he discovers his diary of remembrances from his months of captivity, first deported from his home in Hungary to Auschwitz and then to the slave labor camps of Mauthausen-Gusen and Gunskirchen in Austria. The filmmaker conscripts his two brothers and one sister into retracing their father’s steps in Austria, basically browbeating them into joining him. My father showed a resourcefulness and resolution in those years that he did not generally manifest in the rest of his life. In parallel terms, David Fisher and his siblings found a depth of soul and expressiveness in their father’s diary that he apparently lacked while bringing them up. They spoke of the “physicality” of how their father conceived the world and interacted with them, how he could not understand his children on an emotional level. Yet, despite everything, it must be acknowledged that both fathers succeeded in raising normal families. Does Context Matter In Depicting Cruelties of War? A brutally uncompromising blast of outrage, Vibeke Lokkeberg’s “Tears of Gaza” is less a documentary than a collage of suffering. Dropping us smack in the middle of the Israeli attacks on Gaza in the winter of 2008-9, the film tramples politics beneath the raw weight of civilian testimony. Woven together, these monologues of bereavement and confusion, illustrated with images so terrible they repel rational explanation, form a tapestry of human misery that’s impossible to shake off. …. Postcarnage interviews allow the stunned reactions of three surviving children to shape a quiet meditation on lives irretrievably altered. Unwaveringly committed to a method that spits on context, “Tears of Gaza” forces us to ask a single, electric question: Amid this much horror, does context even matter? My own review at The Forward’s Arty Semite blog does not dispute the brutal facts of Israel’s “Operation Cast Lead”; I am repelled by the human cost of this military action and feel nothing but compassion for the three Palestinian children featured in the film. Still, although I understand it, I disagree entirely with the contempt for context displayed by the filmmaker and endorsed by the NY Times reviewer. Tuesday, Sept. 11, 2012 was a gorgeous sunny and crisp late-summer day in New York, just like that notorious Tuesday, Sept. 11, 2001, which had touched me directly; the smell of burnt plastic and other debris wafted by my Manhattan apartment at the end of a day that changed our world forever. This past Tuesday was the first 9/11 anniversary since I began blogging over six years ago that I chose not to post anything about it. But the deadly attack on the U.S. consulate in Benghazi pulled me back. This is an evolving story, but after some confusion, it appears that the film that ostensibly sparked the violence now widespread in the Muslim world was made by a Coptic-Christian resident of California, originally from Egypt, who claimed initially to be a Jew from Israel. It was promoted by a Christian anti-Muslim activist and radio personality named Steve Klein. Regardless, the 13-minute trailer went viral via YouTube after being dubbed into Arabic. …. The film claims [the Prophet] Muhammad was a fraud. An English-language 13-minute trailer on YouTube shows an amateur cast performing a wooden dialogue of insults disguised as revelations about Muhammad, whose obedient followers are presented as a cadre of goons. Obviously, Muslims have good reason to feel outrage. Yet most people in the Middle East have no concept that the United States government does not control the film industry or what is posted on the Internet. As hateful as this film is, it would almost certainly violate the First Amendment for the government to shut it down; YouTube itself would have to remove this offensive video. But what can we say about the behavior of violent demonstrators, let alone Jihadists who may have used this as an excuse to launch a premeditated attack on the U.S. consulate in Benghazi? What should we say about people who express their indignation by violence against people and property? To raise such questions is to answer them. My vacation reading last month included a memoir of sorts (Early Companions: A Novella) by Werner Cohn, a retired professor of sociology with whom I’ve dialogued and argued over the years. It’s labelled as fiction because he disguises the identities of some people he writes about in short sections that relate to chapters in his life. In one, he discusses his years growing up as a Jew in Nazi Germany in the 1930s. In the second, he relates his brief time as a young member of a revolutionary socialist group in New York, headed by Max Shachtman. Finally, he recounts the beginning of his career as a young professor of sociology at a Canadian university, focusing upon the enigmatic life and death of a charismatic academic who was likewise a Jewish emigre from Nazi Germany. It’s the middle part about Shachtman and the rarely acknowledged influences that he had, which I examine here. Cohn is undoubtedly correct in ridiculing the grandiose sectarian belief system that his “comrades” promoted at the time; his portrait of CLR James (aka Jimmy Johnson) is especially devastating, and his depiction of Irving Howe as an arrogant enforcer of discipline for Shachtman also seems accurate. But Prof. Cohn did not pick up the story of Shachtman and Howe becoming more important later on. Shachtman began as an American disciple of Leon Trotsky, breaking with the exiled revolutionary in 1939 over the nature of the Soviet Union. Trotsky regarded the USSR as a “deformed workers’ state,” worthy of defense by virtue of being a “workers’ state.” Shachtman postulated that the Stalinist state had given rise to a party elite that constituted a new ruling class oppressing the workers. He laid out this theory years later in The Bureaucratic Revolution: The Rise of the Stalinist State (Donald Press, 1962). This line of Shachtman’s thinking inspired an independent socialist current that was in revolutionary opposition to both the capitalist West and the Stalinist East. This “Third Camp” brand of radicalism is perhaps best exemplified in the US today by the New Politics journal and the Campaign for Peace and Democracy.